Neural Knitworks is a collaborative project about mind and brain health. 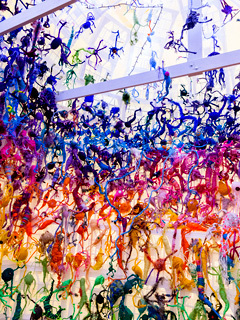 During 2014 an enormous number of handmade neurons were donated (1665 in total!) and used to build a giant walk-in brain, as seen here at Hazelhurst Gallery. Since then Neural Knitworks have been held in dozens of communities across Australia and internationally, with installations created in Queensland, Canberra and Singapore. Following a 2017 debut event at the Cambridge Science Festival in the UK and at Brainfest with Cambridge Neuroscience, in 2018 the Neural Knitworks team have been invited back to Cambridge to work with Cambridge Science Festival, Cambridge Neuroscience and local science communicator Sophie Weeks to produce an international Neural Knitworks project*. Together we will hold Knitwork events in and around Cambridgeshire, and create a giant brain installation at the Science Festival. We invite knitters and crafters all over the UK to download our scientifically-based neuron crafting pattern books and start knitting now so that we can amass enough neurons to create the installation in March. Neurons can be created at home, at work or at school. No knitting experience is required and all ages can participate. Share your creations with our FaceBook Community to inspire others. * If you wish to host a Neural Knitwork event outside of Australia’s National Science Week or the Cambridge Science Festival we ask that you contact us to seek permission to use the material, particularly if you intend to create derivative works or would like to exhibit the giant brain. Please outline your plans in an email. Your creation can be big or small, part of a formal display, or simply consist of neighbourhood neuron ‘yarn-bombings’. Knitworks can be created at home, at work or at school. No knitting experience is required and all ages can participate. More information will be available from the Cambridge Science Festival on how to register for events and where to send your neurons. Check out the neuron microscopy gallery for some real-world inspiration. Neural Knitworks are based on the principle that yarn craft, with its mental challenges, social connection and mindfulness, helps keep our brains and minds sharp, engaged and healthy. increase your attention span and test your memory. Log your event on the National Science Week calendar to take advantage of multi-channel promotion. Share the link^ for this Neural Knitwork page on your own website or online newsletter and add information your own event details. Use this flyer template (2.5 MB .docx) to promote your event in local shop windows and on noticeboards. Read our event organisers toolbox for tips on hosting a successful event. You’ll need plenty of yarn, needles, copies of our scientifically-based neuron crafting pattern books (3.4 MB PDF) and a comfy spot in which to create. Download a neuroscience podcast to listen to, and you’ve got a Neural Knitwork! Join the Neural Knitworks community on Facebook to share and find information about events including public talks featuring neuroscientists. Tweet #neuralknitworks to show us your creations. Find display ideas in the pattern book and on our Facebook page. ^In inviting you to participate, we ask that you respect the rights of contributors who share images and other material. We invite you to share the link http://www.scienceweek.net.au/neural knitworks/ and invite you to access/print the pattern book PDF from the link. The pattern book PDF is not to be hosted on other websites or used for commercial purposes. We also ask that you attribute the founding team and partners as per information on page 3 of the pattern book. Plan your event or display during or close to National Science Week, 11-19 August. Share photographs of your creations in our Facebook community as you go, to help inspire others. Avoid privacy issues by posting or displaying photographs of hands and neurons only. Inspiring Australia’s NSW Manager Jackie Randles worked with the artists to extend the concept beyond the gallery as a National Science Week community art project. Input also came from Jenny Whiting, Heather Main, Deirdre Molloy, Sarah McKay, Rod Dowling, Kuldip Sidhu and Carrie Kibbler. We’ve blogged about the development of the project too. Huge thanks to the many scientific researchers who provided access to inspirational images used as the basis of patterns, and to all those who have donated neurons and offered support and assistance along the way to bring this big woolly project to life. Founding partners include Hazelhurst Regional Gallery, Inspiring Australia (NSW), ANSTO, Your Brain Heath, Brain & Mind Research Institute, the Centre for Healthy Brain Ageing, and Alzheimer’s Australia Dementia Research Foundation. New partner Caringbah Lions Club joins us for 2015. Knit a Neuron, UK: Dr Anne Cooke & Helen Featherstone; Gabrielle Theriault via Ravelry; Sydney Hyperbolic Reef Project and ABC Knit-in (now Wrap with Love Inc), Pistil – X Chromosome, Hiromi Tango Qld GOMA The artists would like to acknowledge the mentorship of Hiromi Tango. The original concept for Neural Knitworks builds on the success of their collaborative project Hiromi Hotel: Moon Jellies at Hazelhurst Regional Gallery in 2013.